One of my favourite painting places is the Middle East, with all its colour and exciting desert scenery, and of course some of the most hospitable people in the world. Unlike many locations, I find it almost imperative to include figures, and much of the time you don’t have to paint those dreadful legs on people, as most wear a djellabah or dishdash. However, in this painting I’m not going to show any people as the scene is viewed from the sea. This is Mutrah fort in Oman, with a typical dhow anchored in the harbour. 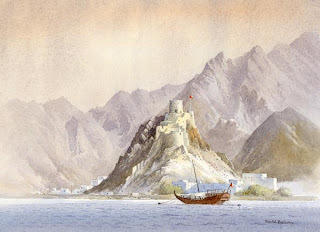 Note how the mountains are almost a monochrome – this pushes them back on to a different plane from the fort and dhow, and is a useful device for throwing the emphasis on certain parts of a painting. Treatment of the sea has been achieved by painting little horizontal flecks of ultramarine and cadmium red across the area, gradually making them slightly larger as they approach the viewer. When this was done I laid a weak wash of the same colour right across the foreground. This softened off the edges of the flecks and made them appear more unified. Now look hard at the dhow. What do you think I took into account when I considered where to place it? The answer is a useful compositional trick. No marks for comments such as “after much deliberation you decided not to stick it on top of the mountain.” The answer will be in the next posting, so you’ve plenty of time to think about it. Enjoy your painting!! This entry was posted in David Bellamy, Watercolor Arab dhow Oman Composition by David Bellamy. Bookmark the permalink.